It's another big one for controversial On Air Personality Miss Nnenna Egwuekwe popularly known as Nenny-B as she was listed as one of the headline celebrities to thrill the cross sections of Abuja and Lagos fans at the Remy Martins All Stars Extravaganza concert. 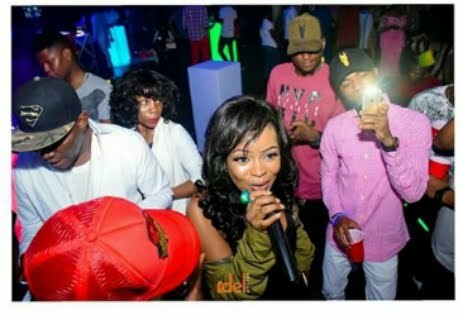 The Imo state born stylish HOT FM presenter who is referred now as Remy Martins Girl will be hitting the playground with A'list artists like Phyno, Runtown, Burna Boy, DJ Jimmy Jatt, DJ Neptune, Dj Baggio, DJ Yosir and DJ mOma. 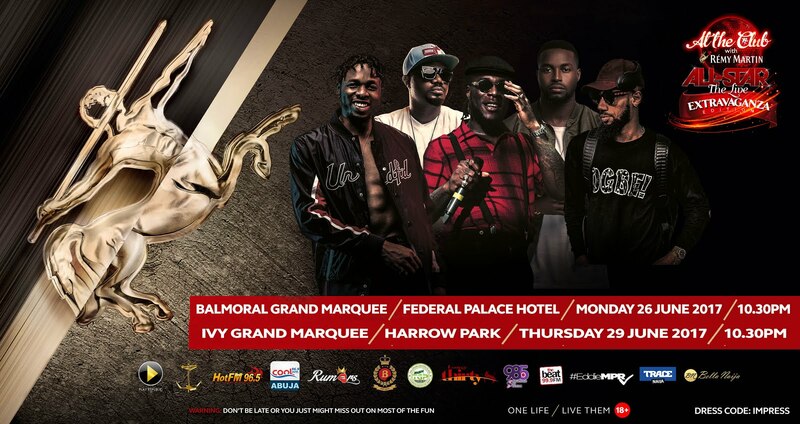 ‎The much anticipated event is holding in 48 hours in two major states from Federal Palace Hotel, Lagos to Ivy Grand Marquee - Harrow Park, Abuja on 26th June and 29th June respectively. The expected guests and fans could pick up their free invites to the Remy Martin All Stars Live Extravaganza Edition from any of the following partner outlets – Bite Billionaire Lounge, Club Rumors, Lounge thirty8 67, Grasshoppers Place while Abuja guests can get theirs from Play Lounge, Caribbean lounge. 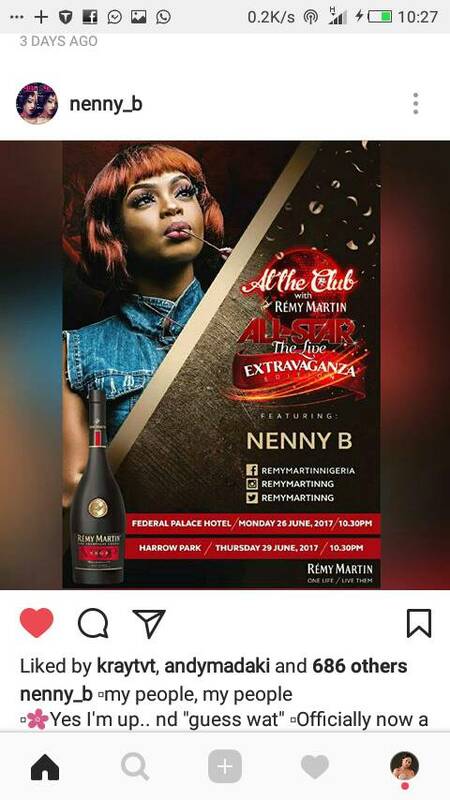 ‎The #AtTheClubWithRemyMartin Allstar series is an ultimate partying experience featuring a collaboration of the biggest clubs/ biggest acts/ DJs under one roof. 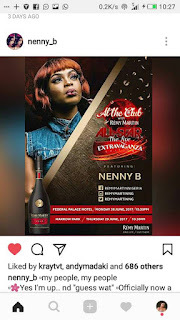 Nenny B‎ who has anchored high profile events in Abuja and beyond will indeed be the cynosure of all eyes when she mounts on the big stage of Remy Martins All Stars Extravaganza. 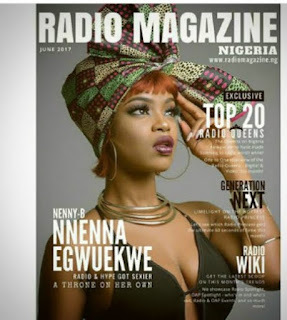 Her dazzling creativity on air during radio programmes perpetually ties the ears of her listeners till the last break. According to her Publicist, AlexReports " her majesty is a dignify and noble specimen of humanity. 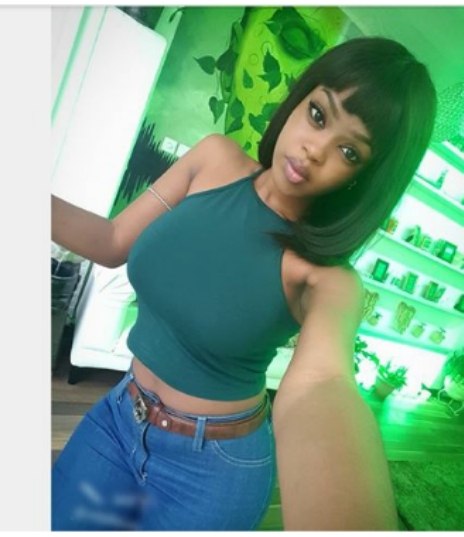 In truth, a young Compere/ media personality whose height is yet to be determined.